The Robert McLaughlin Gallery (RMG) and AWCCU Financial have cashed in on their partnership and are taking art into the community in an unexpected way. In late 2016, the two community organizations unveiled ATM machines showcasing three works of abstract art by Painters Eleven (P11), a focus of the RMG’s permanent collection. 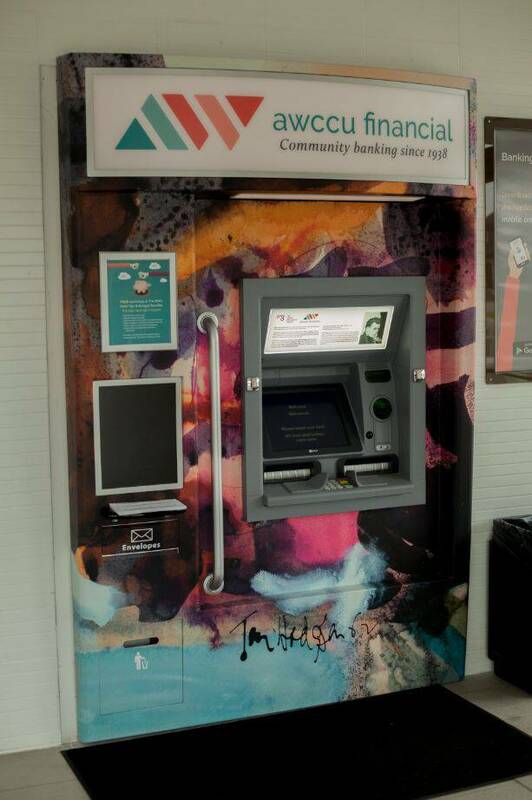 Now when the credit union’s members carry out their financial business at one of three ATMs, they do so at machines featuring colourful works of art and a connection to Durham’s rich art history. It’s a continuation of a partnership in which AWCCU Financial sponsors RMG Fridays, a vibrant, free community event of art, music and fun held the first Friday evening of each month. Meghyn Cox, AWCCU Financial’s creative marketing manager, said the idea came out of a discussion with a colleague when the credit union was updating its ATM technology and surrounds to complement new branding. The colleague suggested working with the RMG and Cox took it from there. Cox imagined using art on the ATMs as a way to build community. She and the RMG worked closely and came up with three works from Painters Eleven. Once AWCCU Financial members approved, wraps were produced for ATMs in Oshawa and Bowmanville. The P11 paintings selected are Encounter by Alexandra Luke, an Oshawa artist, Flowers by Tom Hodgson, and Small Structure by Oscar Cahén. 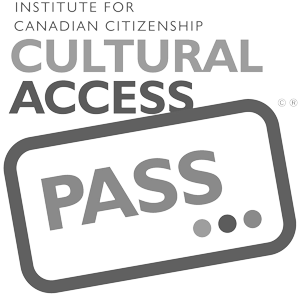 Each ATM carries a small plaque noting the art and the artist. Cox said the wraps have attracted attention as they were meant to do. “We’ve had some feedback from the community,” she said. People have asked why they’ve never seen something like that before and if more ATMs will feature art. Cabral noted the two organizations have this in common. Cox said AWCCU Financial is made up of members of the community which makes it part of the community, as is the RMG. The ATM wraps won’t be coming down anytime soon. “The craftsmanship means we can leave them up for a long time,” Cox said. That’s not to say AWCCU Financial and the RMG have put a wrap on this unique partnership. Cox said she’d like to see it continue, with the original wraps swapped out with different works of art on a regular basis. 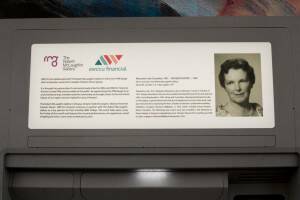 You can check out the art on ATMs at AWCCU Financial in Oshawa and Bowmanville, or at the RMG where at least 11 works from its Painters Eleven collection are on display at all times.